When you are looking for something in between red and white then pink would definitely emerge as your favorite color. The sophistication that pink color brings to eye is much better than the brightness of red. Sometime when you want to present a sophisticated flower bouquets or bunches to your loved ones, and want something better than red and white as red symbolizes love and white is for peace, then pink color flowers will surely meet up your need. Flowers are definitely best presents for every occasion. But sometimes so many things are to be managed in flowers category also. Color and number of flowers are significantly the two things that are decided while presenting flowers to someone close to you. Pink color flowers are the best compliment for those who really want to maintain the sophistication with present. Few people limit pink color flowers to roses only, but this is not the actual case. Pink color flowers are available in different variants and colors other than roses such as gerbera, tulips, carnation and lilies. 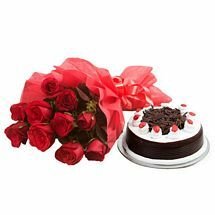 Whatever is your reason of celebration whether the occasion is as big as birthday, anniversary, Valentine, Father’s Day, Mother’s Day or it’s simply a house warming party; flowers will make your special presence felt on the occasion. In case, you are unable to make your presence then you can Send Pink Flowers Online to India from anywhere across the globe with free delivery in the country.